A couple of weekends ago I went on a city break to Berlin with a female friend and without my husband or children. I have not been away by myself for years and it was a real treat. We spent most of the time eating, drinking and wandering aimlessly around the city. We ate at the trendy, vegetarian, Michelin starred Cookies Cream, had a leisurely, retro brunch in the leafy Prenzlauerberg District and drank mind-blowingly strong coffee at uber-cool The Barn. 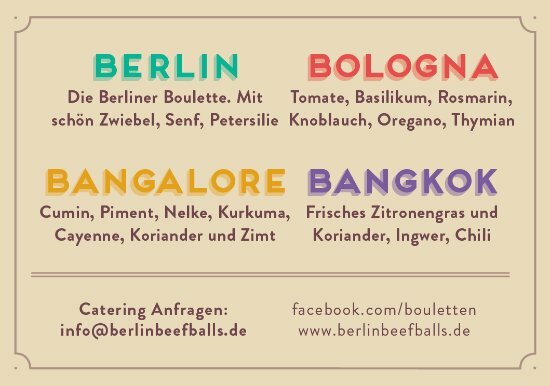 However it was the Berlin beef balls, bought from a small stall in Markthalle Neun, in the Kreuzberg District that was my fondest food memory. Once home, I decided to copy the idea – helped by the promo card which kindly indicated the ingredients in each type of ball. I just needed a little help from google translate. They were fun (albeit time consuming) to make. Once cooked they all looked pretty much the same on the outside so we played an exciting game of meatball roulette at dinner which my son absolutely loved. His favourite were the ‘Bangkok’ but I suspect that’s because he enjoyed saying the ‘kok‘ part exaggeratedly in an attempt to be rude (he is 8 and that is the level of his humour). In the market hall they were rather more orderly, putting four balls of each kind on a skewer and serving with thin slices of dense brown bread and lashings of butter. Makes 40 small beef balls (10 of each flavour). Take 1kg of good quality beef mince and divide into four portions of 250g each. Add the ingredients to each portion according to the lists below. Mix all the ingredients together well with your hands and roll into 10 small meatballs. I find that dampening your hands first with a little water helps to stop the mixture sticking to them. Heat a tiny amount of oil in a frying pan and cook the meatballs over a medium heat until they are a dark brown colour. Take your time here to make sure that they are browned well all over. The process will take around 10-15 minutes. You will need two frying pans for this amount, or you can keep one batch warm in a low oven while you cook the rest. The joy of a lunchtime beer and no responsibilities! I’m extremely lucky to have some brilliant butchers close by and my favourite* has just had a refit. They’ve moved their butcher’s block into the centre of the shop which is a stroke of genius from a business point of view. Last week I didn’t go in meaning to buy a giant piece of brisket but when I saw it beautifully rolled on the slab next to a sharp knife and a smiley butcher ready to cut it to any size I wanted, I just couldn’t resist. I then got home and tried to work out what on earth to do with it. In the end I remembered a delicious beef Madras curry that my husband had once cooked for a dinner party and decided to use those flavours with the brisket. It worked really well and my whole family, especially the children, loved it. To go with the curried brisket I dug out an ancient recipe for red lentil dosa from my file of cut outs. I’ve had it so long that I could only just make out the faded type. Dosa are a type of Indian pancake made from fermented rice and lentils. They don’t contain any flour and so are perfect for anyone with a gluten or wheat allergy. Trim the excess fat from the piece of beef brisket and cut the string to unroll it if you’ve bought it rolled from the butchers. Place all the ingredients for the spice paste into a small bowl and mix until smooth. Spread the spice paste all over the brisket, cover and leave to marinade in the fridge overnight. Take a heavy casserole dish with a lid, add the ghee/butter and heat to a medium high heat. Sear the brisket for a couple of minutes on each side. Throw in the sauce ingredients, add enough water to cover the meat and bring the liquid in the pan to the boil. Cover with a disc of baking paper (touching the surface of the meat and liquid) put the lid on and cook in the oven for 5-6 hours until the meat is tender. Remove the pan from the oven, but leave it covered with the meat inside for a good 30 minutes. Remove the beef from the pan and shred, removing any big lumps of fat. Add the beef back to the pan and give it a good stir to coat with the curry sauce. You can serve the brisket warm or cold. NOTE: This does make an enormous amount and fed our family of four generously for 4 meals. 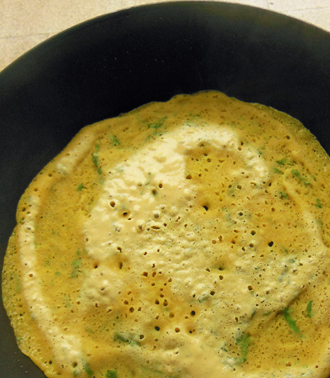 The first night we had it wrapped in a red lentil dosa (see recipe below). There were two meals with rice and we also ate it in home-made baguettes (my husband’s idea – a bit weird but delicious). Place the rice, lentils and water in a bowl and leave to soak for 8 hours. Pour the whole mixture into a food processor and blend until you have a smooth batter. Pour into a bowl, cover with cling film and leave to ferment for 24 hours at room temperature. When you are ready to cook, stir the salt, turmeric and coriander into the batter. Heat a non-stick frying pan over a medium high heat and smear with a little oil. Add a ladle full of batter and smear around with the back of a spoon to fill the pan. Cook on one side for a couple of minutes until set. Drizzle a little more oil around the edges, then flip over and cook on the other side for about one minute. Keep the cooked dosa warm in a low oven, wrapped in a damp tea towel whilst you cook the others. Serve warm. 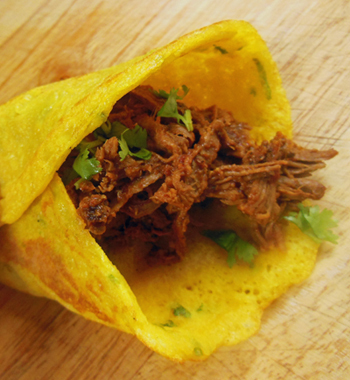 NOTE: These are lovely filled with the curried brisket (recipe above) but they also go well with others curries and make a nice alternative to rice. I love beef brisket. Not only is it economical and full of flavour but it’s also very forgiving. You just have to cook it nice and slow for at least 4 hours and it always turns out fine (unlike topside where there’s always a risk that it will be overdone and tough or underdone and the kids won’t eat it). For years I’ve been cooking brisket in the same old nice (but boring) way. But then along came the lovely John Whaite who changed my outlook on this humble cut of meat. 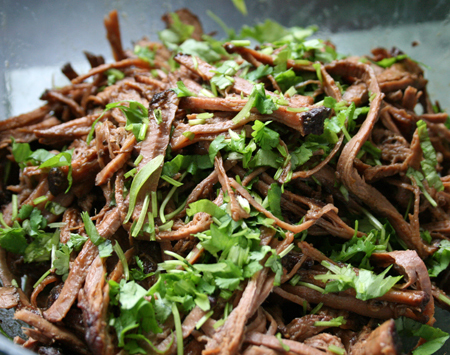 His ‘Anglo-Vietnamese shredded beef brisket’ is brisket with pizzazz. The technique is similar to mine, but with the addition of a few new exciting flavours you get a lighter, sunnier kind of dish – one that you serve with flat breads and spicy coleslaw rather than Yorkshire puddings and potatoes. There is obviously a place for both but it’s good to have another option, especially in the hotter spring/summer months when a traditional roast doesn’t really suit. Rub salt and pepper on the entire surface of the meat and sear it in a heavy casserole dish with a lid over a medium-high heat for a minute on each side. Throw in the other ingredients and bring the liquid in the pan to a boil. Cover with a disc of baking paper, touching the surface of the meat and liquid. Put the lid on and cook in the oven for 4-4 ½ hours, until the meat is tender. Remove the pan from the oven, but leave it covered with the meat inside for a good 30 minutes. Remove the beef from the pan and shred, removing any big lumps of fat. Then pass the cooking liquor through a sieve before returning to the pan along with the shredded beef. Scatter with freshly chopped coriander before serving. I served mine in a tortilla wrap (bought I’m afraid) with an Asian flavoured coleslaw (basically red cabbage, onion and carrot with leftover gyoza dipping sauce chucked over the top). It’s been a busy week so I’m not going to babble on – I’m just going to tell you about this brilliant burger recipe (similar to Hugh Fearnley-Whittingstall’s Bloody Mary burgers in River Cottage Everyday). There’s nothing like a good burger and I always make my own because then you know exactly what you’re eating (not that I have anything against eating horse but I’d rather choose to do so). You do need decent quality steak mince though, preferably from a good local butcher. If you’re not from Nottingham then you can skip this part because this is where I do a shameless plug for my two favourite local butchers. But this is only so that plenty of people use them and they don’t close down. Take a large mixing bowl and add in all of the above ingredients. With your hands mix together, scrunching up the ingredients until they are evenly distributed. Cover the bowl with cling film and leave for at least 30 minutes so that the flavours mingle. Divide the mixture into 6 – 8 portions (depending on the size of burger you want) and with your hands mold into burger shapes about 1 ½ cm thick. If you press the mix down inside a large circular pastry cutter you get a nice uniform shape but I don’t worry too much about this. Ideally these should be cooked on the barbecue but it’s not quite the weather for that yet, so set your grill to its highest setting and cook the burgers for between 4 and 10 minutes on each side. I like them pretty well done (to recreate that charcoal barbecue like taste) so I cook for 10 minutes each side (as you can tell by the photo). You can reduce the time if you like them rarer (and this is fine as long as your mince is good quality) to 4 minutes on each side. How you serve your burger is up to you, but for me it has to be a soft white cob with polish ketchup, mustard and gherkin. Note: I like to make plenty of these as they are great sliced thinly the next day and eaten cold in a sandwich. This is a bit like a beef version of haslet and is delicious with mustard and mayonnaise. I’ve been eating lots of very basic food in January – baked potatoes with cheese, home-made wedges with a fried egg on top, dhal (as in my last post) – that sort of thing. There’s not been much meat involved which is fine but I can’t keep it up for any extended period and it’s not long before I crave a giant juicy steak. This is a perfect recipe for a spicy, meaty, Friday-night feast. 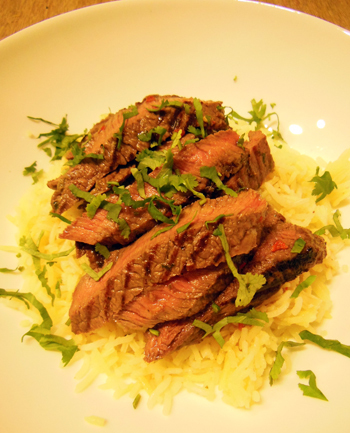 I wouldn’t use cuts like sirloin or rib-eye (which in my view are best simply cooked with no sauce or marinade to hide their delicate flavour), but it works tremendously well with rump steak which is cheaper and a little less flavoursome. Do still try to buy decent rump steak from your butcher if you can, or the best that the supermarket has to offer. Served with salad I wondered whether this recipe might be good if you’re cutting out carbohydrates, only then I realised that the dressing has 2 teaspoons of sugar in it (which of course is the most evil carb of all, or so I’ve been reminded almost every-day this year). Perhaps though you could use some sugar substitute which I’m sure they sell in Holland and Barrett. This dish also works well as a dinner party starter. Steak is really difficult to cook for a larger group (unless you have multiple griddle pans) but with this recipe one large steak, cut thinly, can stretch to serve up to 8 people as a starter or as one of a number of dishes in a banquet. Combine the marinade ingredients in a mini chopper or food processor and blend well. You can also do this in a pestle and mortar. Spread the mixture over the steak and leave to marinade in the fridge for a few hours. When you are ready to cook the steak, remove as much of the marinade from the steak as you can while you heat a griddle or frying pan over a high heat. You will not need to add any additional oil if you are using a griddle but if you are using a frying pan then add a tablespoon of oil to the pan before adding the steak. Cook the steak for about 3-4 minutes on either side. Keep the heat really high and don’t move the steak around the pan during cooking and turn just once. Remove the steak from the pan, cover with foil and leave to rest while you make the dressing. Mix all the dressing ingredients together and stir well. If you are serving with rice then cut the steak up into thin strips, place over the cooked rice (to cook see my post Nice Rice) and spoon over the dressing. Add some chopped coriander (and extra chilli if you like) to garnish. Make a salad using one small soft leaf lettuce, ½ a cucumber (chopped into small chunks), a handful of cherry tomatoes (halved) and 4 spring onions (chopped). Slice the steak thinly and place over the prepared salad. Spoon over the dressing and add some chopped coriander (and extra chilli if you like) to garnish.